When we published our stance on how we handle editorial content (you can see that here), we weren’t sure how it would be received. We know it was the right stance for us to take, because, well, it’s right. But we also know it’s, well, not the norm for some of the other review sites out there. As it turns out, at least one other brand agreed with us that it was the right way to go, and were refreshed to see our clear and transparent approach. That’s how we got around to being loaned a couple examples of the Jon Oscar Vanguard. I will say, right off the bat – if for some reason you strongly dislike circles and spheres, the Jon Oscar Vanguard is certainly not the watch for you. It is chock full of ’em! I mean, sure, most watches start off with a circle for the case most of the time, and automatic movement rotors scribe a circle as it spins. This watch takes the rounded, circular theme all the way to 11. First off, you’ve got the Jon Oscar logo itself, which is four circles arranged in a layout that calls to mind (due to my day job) the Elasticsearch logo. Then, you get hollowed-out pommes on all three hands, circles for the date display and the 24-hour sundial (locked to the main time), and then one last circle for the outer ring that contains the main hour indices. If that wasn’t enough, you’ve got the smooth, spherical crown over on the side. Now, about that crown on the Jon Oscar Vanguard. It’s not screw-down (hence the 50m WR rating) so the absolute lack of knurling or ridges is not a problem. It’s a simple matter to pull the crown out, make your adjustments to the time (or wind the movement), and then push it back in. Frankly, I can’t imagine any other sort of crown would look good with this watch, now that I’ve experienced it. It’s a commitment to the theme, even in smaller details, that is, well, fun! Or, if not fun, keeping their design language coherent. Tucked into the case of the Jon Oscar Vanguard is a rather familiar name – it houses a Miyota movement. Long-time readers of WWR will realize that the presence of a Miyota movement is shorthand for a lot of good things – an automatic mechanical movement, accuracy and reliability, serviceability, and a more affordable price point. Of course, in the limited time we have with review loaners, it’s hard to assess long-term reliability, but while I had the watches on my wrist for the review period, they kept solid time. For our review, we had two examples in of the Jon Oscar Vanguard. The first one was the black-dialed version, which has a rose gold tone to the case, and a lighter burgundy leather strap. This was ok enough, but if you like taking watch photos, be prepared for a workout. That black dial is a reflection monster. On the other hand, the white dial, which is set in a deep bronze tone case and paired to a very dark brown leather strap, is a delight to photograph (and quickly became my favorite). Not only that, with the white/silver dial, you can really see the grainy texture of the dial, which is a nice treat when you zoom in to see what you’ve got. There are three other color combinations in this lineup as well, which will give you a variety of choice. Which, in any watch is a good thing, but when it comes to a dressier piece – and make no mistake, the Jon Oscar Vanguard is a dress watch – that’s a very good thing, indeed. Aside from your own personal tastes (for instance, I’m not a big wearer of yellow gold), you want to make sure your watch is going to work with what you’d normally be wearing it with. If you’re all black tie / black suits, perhaps the bronze case and brown strap aren’t for you. That’s just one example, of course. Unlike sportier watches, you should really think about the specific cases a dress watch is meant for. While it’s great if it can be a multi-talker (which, a solid tone dial in steel case and bracelet will be), they tend to be more purposefully selected. At least, that’s how I think about them. 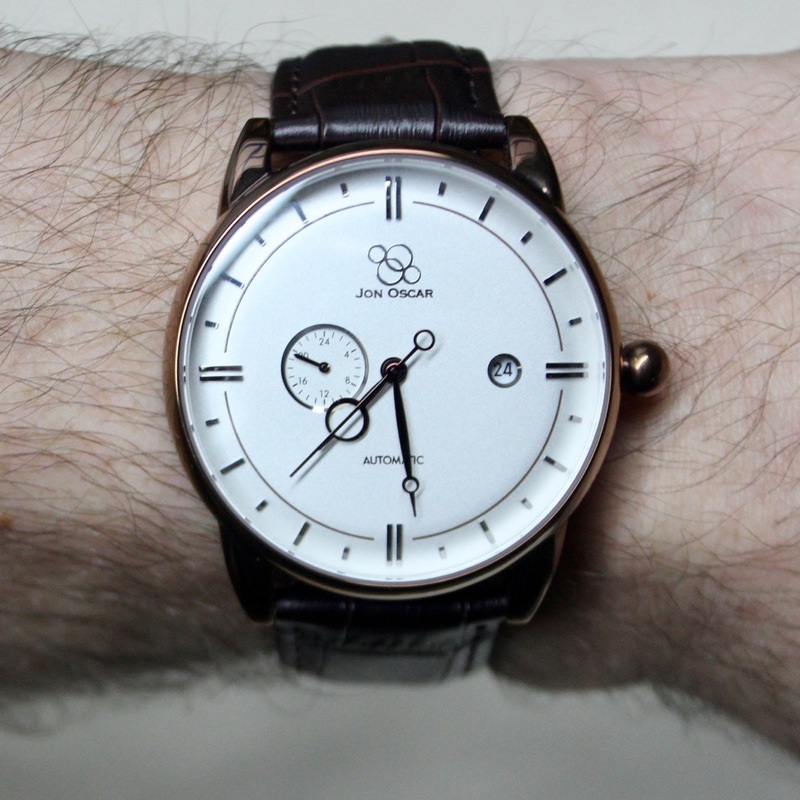 What I’d change: On the black dials – even though we’re dressy – perhaps a less glossy finish? The best thing about it: Did you not read the review? Fine – picking a single element, we’ll say, commitment to the circular theme, through and through. Great wristwatch. What if the hour markers were also circular shaped?